Ever thought of visiting a country that epitomizes the word beauty in every sense? 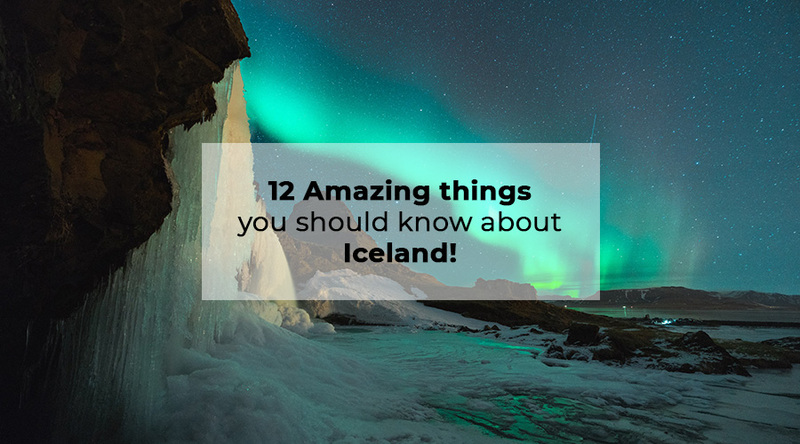 If not, it definitely has to be Iceland! The undulating hills, lush green landscapes, volcanoes, relaxing hot springs and freezing glaciers are sure to leave you all spellbound on your trip to the Land of Fire and Ice, Iceland. Iceland is a country where landscapes change beautifully with seasons. If you visit Iceland in June, you will notice that the country is in a major snow melt with waterfalls gushing water with full force. One major thing to keep in mind on your trips to Iceland is to dress in layers as the weather is very unpredictable. During the summer months, you will have almost 24 hours of sunlight, giving you more time for sightseeing. During the winter months, only 3-4 hours of daylight is present, making the northern lights visible like never before! On your trip from the Airport to Reykjavik, remember to sit on the right side of the bus if you wish to have a change in scenery. On your left side, you will see nothing but large expanses of lava fields and glimpses of the ocean. Lava and water bodies coming together is a sight that is sure to leave you to spell bound on your trip to Iceland. If you are travelling in winter time do not miss the opportunity of seeing the Northern lights. The spectacle of the Northern Lights is a sight that all of us would love to capture. If you wish to see the northern lights in all its glory, it is very essential to carry a DSLR along with the SLR card. If you forget to carry your SLR card, no matter how well you capture the lights, you could end up with a bunch of dark and blurry pictures. Under circumstances when the activity is extremely high, this is not required. While this natural attraction, it has been generated from characteristic components produced many feet under the earth – its curious dark-blue water. In order to enjoy an authentic bath in Iceland’s natural warm waters, this place is the best as it is not very crowded allowing you to be at peace with nature. The water temperature in the bathing and swimming zone of the tidal pond midpoints 38– 39 °C (100– 102 °F) and whilst you relax in the warm water you can enjoy the ever erupting hot Geysers all around you. Whale watching is something you should definitely not miss out on your Icelandic holiday. Amid the mid-year months, the shores of Iceland turn into the essential feeding ground for whales and other extensive marine creatures, allowing you to watch these astonishing creatures in their natural environment. This is your opportunity to observe a humpback or a blue whale in real life! The South Coast of Iceland is an incredibly beautiful and delightful place. It has everything – waterfalls cascading through cliffs, icy masses, serene shorelines, natural hot water springs, mountains, volcanoes, glaciers, and little towns. If you are searching for an adventure not so far from Reykjavík, the South Coast is an extraordinary place to go! Exploring the south coast by bus makes your journey even more comfortable and safe, yet thrilling at the same time. You can either experience the south coast on a day excursion with guidance or on your own in the summer season with the South coast bus at your own pace. The South coast bus stops in several small villages such as Hveragerði, Selfoss and Hella, and by interesting sites like Seljalandsfoss waterfall, Skógar waterfall, Skaftafell national park, and the magnificent Glacier lagoon. This is one of the most splendid sights that Iceland has to offer. Being easily accessible via the road, Seljalandsfoss waterfall catches the travellers eye because of its very peculiar feature – an actual cave where you can walk behind the waterfall! When in Iceland, you should not miss out on this walk as you might get to see rainbows and sunset which makes your jaw drop! Skogafoss Waterfall is a natural wonder which leaves you astonished when approached from below. The height from which it falls leaves travellers amazed! Not just this, there are stairs from where you can climb on the top of the waterfall to get an altogether different perspective of the country. The lush green landscapes and snow-covered glaciers is a sight one needs to take a look at during the course of his life. Previously ranked as one of the main ten non-tropical shorelines, Reynisfjara is a black sand beach including cliffs of basalt segments. The water is an incredible sight to see, however, remember the waves can be risky and capricious. In the ocean, you can discover the exceptionally shaped basalt ocean stacks, Reynisdrangar. Skaftafell holds an exceptional place in Iceland’s heart. For a considerable amount of time, this lovely territory has been a standout amongst the dearest destinations for Icelanders to spend their summers with their families. Really, Skaftafell region in Vatnajökull National Park is one of the must-see destinations in Iceland. This wonderful natural park in the south of Iceland is settled on the southern edge of the relentless Vatnajökull Glacier. One of the most picturesque tourist spots is the Jokulsarlon, glacier lagoon in Iceland. It is believed to be the country’s crown jewel. Even though it is not really side, it is more than 250m deep which makes it the deepest lake in Iceland. This is surely a sight you should not miss on your visit to Iceland as the lagoon’s crystal-clear surface scattered with icebergs is sure to leave you spellbound! Upon your visit to the Land of Fire and Ice, you will notice that there is no need to hire a portable hotspot as almost all business institution offers free wifi in Iceland. For travellers who worry about staying connected with their folks, Iceland is the ideal travel destination. Even the gas stations on extremely remote stretches will provide you with Wi-Fi facility. The Wi-Fi coverage in Iceland is so great that even we at Sterna Travel have Wi-Fi in our buses. Iceland is a country offering tourists from all over the world phenomenal travel experiences. On your trip to Iceland, do remember to keep these points in mind. Also, for comfortable and memorable travel experience, opt for the Icelandic travel packages at Sterna Travel. At Sterna, we ensure that our clients cherish their Icelandic experiences. Check out our tours here and ways to travel at your own pace here. Sterna Travel offers guided day tours and Northern lights tours from Harpa Concert Hall downtown Reykjavík for groups and individuals with guidance in English. We are a fully registered travel agency and have been a proud recipient of TripAdvisor’s Certificate of Excellence for three consecutive years.